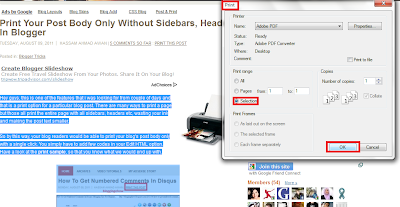 The article showed ways to print out the post pages of a blog without sidebars and other unrelated stuff so to avoid ink lose and to make the post area bigger. But what if someone wants to add the print feature to there main blog page with all post fully featured without those read more pages? The trick is simple. Highlight the text and images that you want to print. In this case, highlight the post that you want to paste and press (Ctrl + P). Now click 'Selection' and press print. That's the only way to print a specfic area. As the 'print' button prints out the current page whether its post page or home page. Hope that was helpfull. If you have to request a particular tutorial, feel free to comment below.